Saints Academy head coach Mark Hopley says he can't wait to work with England Under-20s. Scaysbrook and Richard Whiffin in the national set-up. All three men join for 18 months as part of the latest coach development programme agreement signed between the Rugby Football Union and Premiership Rugby. The programme will run alongside the coaches’ current club duties and will include the 2019 Six Nations as well as next year’s World Rugby U20 Championship tournament in Argentina. 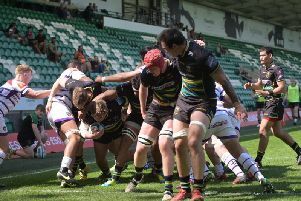 The Under-20 coaching team will be supported by RFU pathway performance coaches Steve Bates and former Saints boss Jim Mallinder. And Hopley said: "I’m really excited about this opportunity to coach England Under-20s and to work with an extremely talented group of players. Hopley, Scaysbrook and Whiffin will receive an individually designed coach development programme, led by head of professional coach development Gordon Lord. It follows a successful trial in 2016/17 which saw Louis Deacon, Tom Williams and ex-Saint Ian Vass, who has gone on to coach at Montpellier, lead the Under-20s to Six Nations glory as well as into the final of the World Rugby U20 Championship. Last season saw Anthony Allen, Richard Blaze, who was recently appointed forwards coach for England Women, and James Ponton join the programme in the second year of the agreement. This year’s coaches will also be directly involved in preparing for, delivering and reviewing the Under-20’s coaching and playing programme. The coaches will also have access to mentors and be exposed to a range of non-rugby elite performance environments that will involve visits to and interactions with coaches, support staff and athletes from a range of sports.